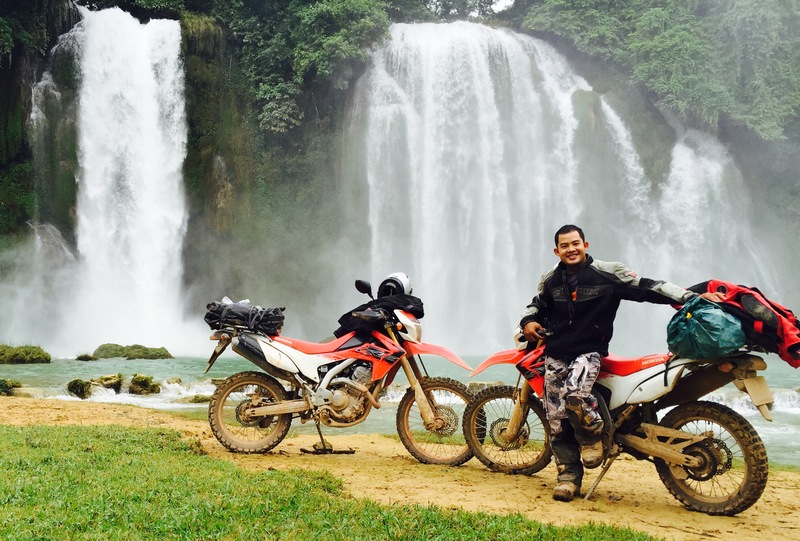 Covering the most beautiful parts of Northern west Vietnam including Sapa, Mai Chau Valley…and Full Northern East of Vietnam with Ha Giang, Ban Gioc waterfall and Halong bay, this North Vietnam motorcycle tour is one of the best collective motorbike tours in Vietnam. 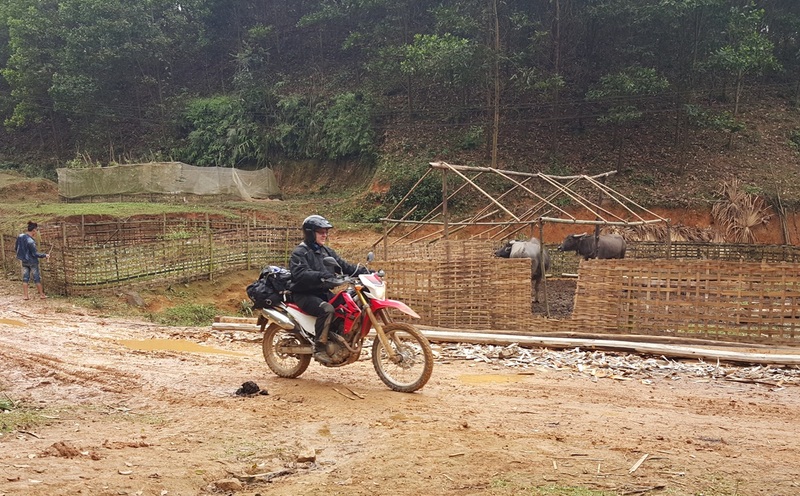 The tour is the mixture of on and off road riding including many winding mountain passes, dirt tracks… therefore it’s one of the greatest motorbike rides in Vietnam but it’s not for the beginners. Mai Chau Valley is one of the less touristy destinations in North Vietnam which quite close to the capital city of Hanoi. It’s about 150km or 3 hours drive by car on the highway No 6. 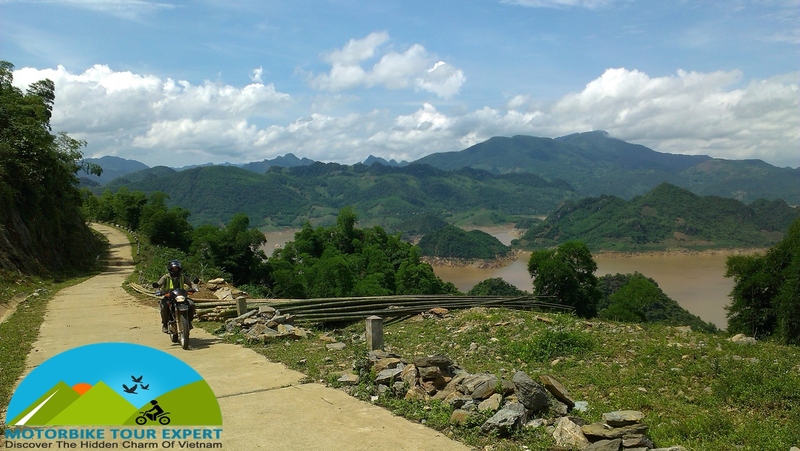 Mai Chau is also the popular destination of Vietnam Motorbike Tour Expert. Instead of taking a drive on the boring highway, we will ride together to Mai Chau on our own route to this valley crossing through many other rural villages to make the ride safer on the smaller roads and especially you can see what the hidden beauty of Vietnam is. 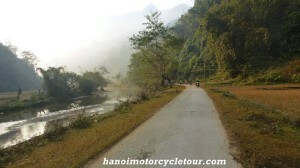 The motorbike tour to Mai Chau ends at around 5:00 pm at the peaceful village of the Thai people whom we’ll stay with. It’s a short and enjoyable motorcycle ride up to North of Vietnam to Phu Yen. We can start the ride at round 9:30 am after a short walk around the peaceful villages of the Thai people to enjoy the daily life of the local people in the rural areas and learn more about the culture of the hill tribes in Vietnam. Being back on the bikes then we keep motorcycle touring up Northern Vietnam to Moc Chau plateau. 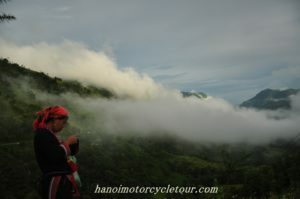 The motorbike ride from Mai Chau to Moc Chau is almost on the winding passes with beautiful view. 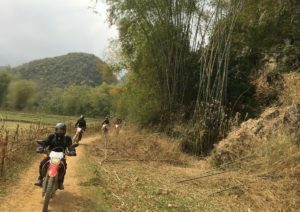 If you are fans of off-road motorbike ride, the guide of Vietnam Motorbike Tour Expert will take another option to give you more time to ride off-road before getting to Moc Chau. We’ll end the short but joyful motorbike ride in Phu Yen at around 4:30 pm. Stay in a small hotel in town. Start the day at 7:30 with hot café and rice noodles for breakfast. After saying goodbye to the little town of Phu Yen, we continue the great Vietnam motorbike tour with a long ride to Mu Cang Chai and Phu Yen. 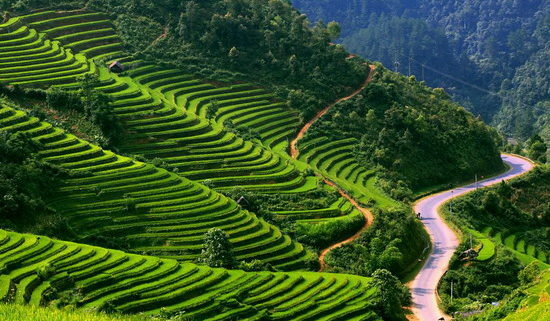 It’s more than 200 km of mountain passes and back-roads cross through many villages of the H’mong, Dzao, Thai people and especially we will have chance to take pictures of the amazing rice terrace fields in Mu Chang Chai if you do the tour at the right time (from June to September). Today is one of the highlights of this motorbike tour in North Vietnam. We arrive Than Uyen at around 5:00 pm. This motorbike tour to Sapa is the shortest day ride of the trip but it’s the highlight of this Northern Vietnam motorbike tour. We’ll ride through some very large green tea fields and cross the O Qui Ho pass – one of the longest passes in North Vietnam with amazing view of the Hong Lien mountain range where you can see the highest peak in Vietnam and in Indochina as well – the Fan-Xi-Pan peak with the height of more than 3140 m. We’ll be in Sapa at noon, after lunch we’ll ride around Sapa to see more hill tribe’s village, rice terrace fields or just leave the bikes to let your feet walk around the Sapa town or have short trek around. After having breakfast and saying good bye to Sapa, we will enjoy one of the most beautiful offroad motorcycle tours in North Vietnam from Sapa to Xin Man. Right after leaving Sapa town we can make a turn on the small back-roads through some villages of the red Dzao and black H’mong people, if you do this Vietnam motorcycle tour from June to September you must have plenty of picturesque photos of the rice terrace fields nearby Sapa. If you come another time, you may not see the rice fields but still the great chance to experience the culture of the local colorful hill tribes. After lunch in Lao Cai town and next to Chinese Border, we keep riding up and up to the Bac Ha town located at around 1000 m above the sea level, the ride is almost on the winding mountain passes and bumpy – dirt roads. We’ll end the day at little town of Xin Man. Stay in a guesthouse. 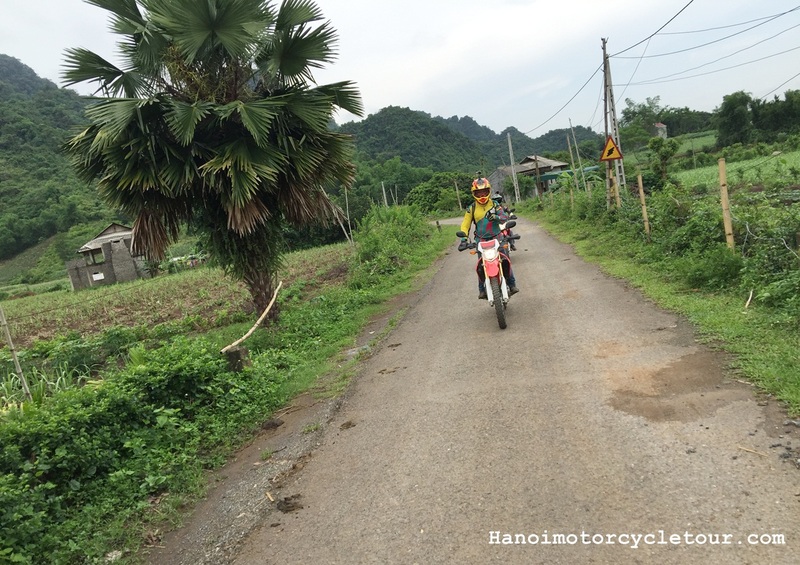 Start the motorbike tour to Ha Giang with a short off-road ride right after Xin Man town. 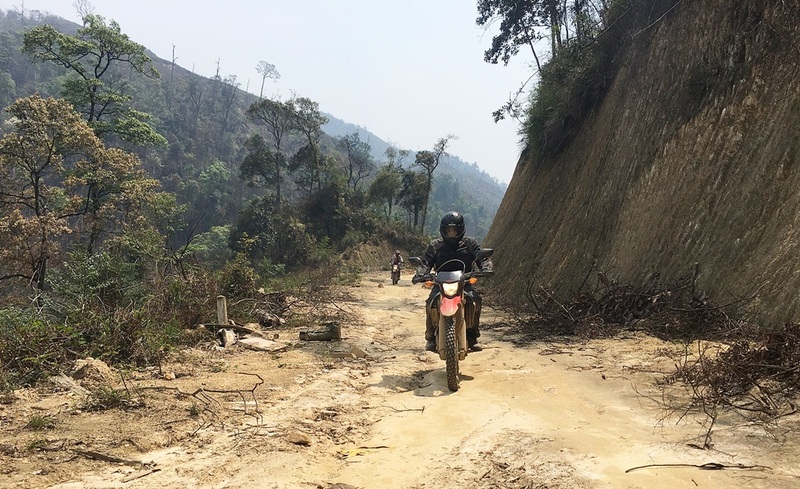 The first half of this motorbike ride to Ha Giang is almost on the bumpy, dirty tracks but offer a great chance to be closed to the local people by riding through the villages of the hill tribes. The rest of the ride is on quite smooth road to Ha Giang city, we can be at the city of Ha Gaing at around 4:30 PM, check in the room in the Thuong Xuan resort, this is one of the best accommodation in Ha Giang and it must be the best stay of this Vietnam motorbike tour, let’s enjoy the peace of the nature and save energy for the next adventure by motorbikes. Having no hesitance to say this is the best ride of the motorcycle tour in North Vietnam. The ride is along the Chinese border via the imposing Dong Van Rock Plateau on all the winding mountain passes offer amazing view of nature, especially riding motorbikes crossing the Ma-Pi-Leng pass – One of the longest and most beautiful passes in North Vietnam. Beside the breathtaking scenery, this Vietnam motorcycle tour on the Rock Plateau also offers a great chance to learn more about the culture/tradition of the local ethnic people. We will end the great ride at the town of Meo Vac at around 5:00 pm. Cao Bang means High Plateau in Vietnamese. It’s the land with rich culture and turbulent history, it’s also the second homeland of Ho Chi Minh where he spent most of the time to live and work before the Dien Bien Phu battle in 1954. 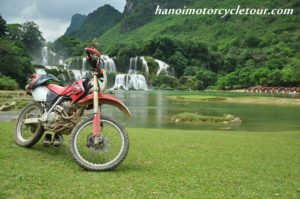 Cao Bang is now quite busy town; However, the Vietnam motorbike tour to Cao Bang is still one of the most enjoyable trips because of the beautiful routes to the town and after the town to the Chinese border. The motorbike ride from Meo Vac to Cao Bang today is almost on-road, crossing some scenic mountain passes we’ll be in Cao Bang quite early, check in the room in hostel, relaxing to save energy for the next long rides or try a local beer on the street. This is another highlight of the 13 day North Vietnam motorbike trip, after saying goodbye to the host the experienced guide of Vietnam Motorbike Tour Expert will take on the scenic roads leading to the Chinese border, the ride is almost on-road offering amazing view of mountains and rice fields between villages of the ethnic people. We’ll be at the Chinese border where we can see the biggest and most beautiful waterfall in Vietnam – Ban Gioc at the noon time. Stop riding for lunch and then spend the relaxing time to take pictures or swim at the waterfall. After the great time with the waterfall, we’ll be back to the beautiful roads and enjoy again the motorbike ride to little peaceful town of Quang Uyen. We’ll arrive at the family of the Tay people nearby the town at 5:00 PM, getting off the bikes then enjoy the relaxing time with the family. Mau Son is one of the highest picks of the mountains in Northern Vietnam, Vietnam Motorbike Tour Expert is one of few organizers who plan the tour to this unique destination. The motorbike tour to Mau Son today is along the frontier area closed to China, crossing some border gates. The ride is almost on the smooth mountain back-road with a nice view. At the end of the ride we have no choice but crossing through busy Lang Son city where you can take a quick visit to some famous and very large markets in the city. We’ll arrive at the guesthouse in Mau Son at around 5:00 PM. Continue the full North Vietnam motorbike tour at around 8:30 Am, we’ll keep riding motorcycle along the Chinese border but the roads are almost sealed and not so steep, it must be an easy motorbike ride with some stops to take visits to some interesting rural villages or local markets. The ride in the afternoon when we get closer to the Halong city is busier with traffic but we can enjoy a difference from the days before when we’re closer to the sea and riding on the coastlines. We’ll be in right center of Ha Long city at 4:30 pm. Stay in a hotel. After breakfast, we’ll have few hours to discover the touristy city of Ha long before getting on the boat. We can have a walk around the city center to visit more markets for some shopping or take a short ride to another part of the city with nice coastal road to Tuan Chau Island. Be back to the tourist wharf by around 11:00 am to check in the boat then spend relaxing time on boat with fresh seafood, cold drinks, swimming or Kayaking… after a long motorbike ride around Northern mountain in Vietnam, this boat cruise is perfect to cheer up. Stay on boat in a private cabin. Getting up early to enjoy a peaceful morning on the bay or experience the Taichi on the rooftop of the boat. 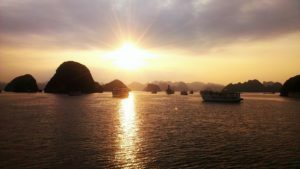 After breakfast, we’ll keep cruising around the beautiful Halong bay until 11:00 am when we get off the boat then continue the motorbike tour back to Hanoi. The ride back to Hanoi is quite busy but we have no choice, we’ll be back to Hanoi and end the great North Vietnam motorbike tour before 4:00 pm. After many year touring around Vietnam by Motorbikes, we realized that Northern Vietnam has enough conditions to have an wonderful motorcycle ride. This 8 Day motorcycle tour Vietnam offer a great chance to discover all the hidden beauties of land and people in the Northeast of Vietnam. During the motorbike ride, you’ll see many different colorful hill tribes with great view of Ha Giang and Dong Van Rock plateau, Thac Ba and Ba Be lake or the most beautiful waterfall of Ban Gioc. Start discovering the Northeast Vietnam by motorbike at 8:30 from our bike store. We’ll head out of Hanoi on the winding road along the red river. It’s a beautiful 50 km dyke road from Hanoi to Viet Tri town. After the town we can be back to ride along the Thao river up to North Vietnam. 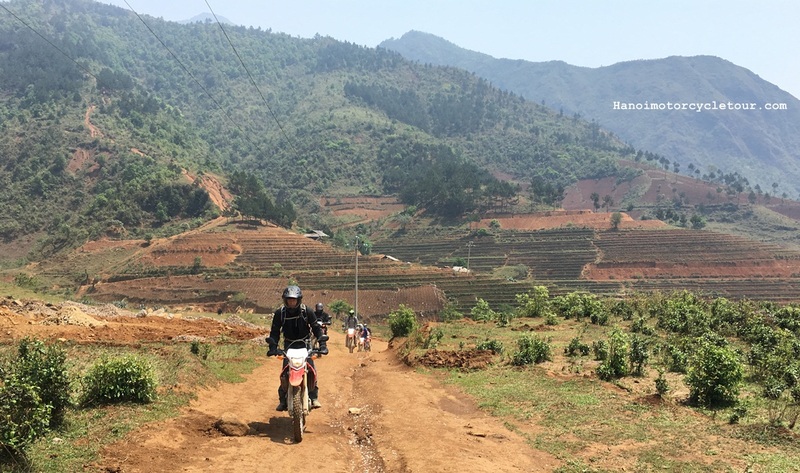 The ride along the winding dike road is one of the highlights of this Northeast Vietnam motorcycle trip. After lunch in Doan Hung Town, we have 2 different choices to be on the long or short road to Thac Ba lake. If we arrive at the lake early and the weather permits, we’ll have a short boat trip around the Thac Ba lake – one of the largest lakes in North Vietnam. After breakfast with the friendly host (Family of the Dzao people), we’ll keep motorcycle touring up to North Vietnam to Ha Giang, The ride in the morning is almost on the back road along the Thac Ba lake it crosses some short mountain passes the after lunch we’ll hit the smooth road straight to Ha Giang. We could be in Ha Giang early to ask permits to continue the motorbike ride to remote area along the Chinese border in the following days. It’s the short distance of motorbike riding today but the road is zigzag and not easy so we can’t ride fast however, the Ha Giang motorcycle tour to Dong Van via the Rock Plateau or the Global Geo-park is one of the best motorbike tours in Vietnam. Every meters of that “snake” roads offer you a amazing view of mountain or the rustic but interesting villages of the colorful hill tribes. We’ll finish the great day touring in Dong Van at around 4;30 PM. This is another short day of motorbike touring in Ha Giang, before starting the motorcycle riding, you can have a short walk around the Dong Van town to see the local market where you can see some different color hill tribes or to have a look at some beautiful ancient buildings in town. After leaving the peaceful town of Dong Van, we continue the Northern Vietnam Motorbike Touring on the rock plateau of Ha Giang and cross the imposing Ma Pi Leng pass – one of the longest and most beautiful passes in the North of Vietnam. After lunch in Meo Vac, we’ll hit all the way down along the Nho Que river to the town on the riverside named Bao Lac. After simple breakfast in town, we keep riding along the Nho Que river. The ride offers a different view of mountain from the view of the Rock plateau you’ve seen days before. (Mountain looks greener with plantation and rice terraces). After lunch in the rustic restaurant in the middle of nowhere, we continue the North Vietnam motorcycle ride up to Cao Bang then cross the city to join again a quiet, joyful back-road to ride to up all the way to Ban Gioc waterfall in the top North Vietnam. We’ll stay on the way at Quang Uyen town in the guest house or home stay with the Tay people. This is another highlight of this motorcycle tour in North Vietnam, we’ll ride to the one of the most remote areas in the North of Vietnam which offers mostly back-road and off-road motorbike ride with amazing view of mountain. We’ll get touched to the Chinese border where Vietnam and China share the most beautiful and imposing waterfall – the Ban Gioc waterfall. After picnic lunch, we’ll enjoy the relaxing time at the waterfall, taking pictures of the nature’s beauty or swimming at the natural pool nearby the waterfall. In the afternoon, we’ll take ride motorbike back to Cao Bang city, spend a night in the city to enjoy the different excitement of the City in Northern Vietnam after staying some nights in remote part of Vietnam. After getting out of the city, we join the winding road No3, crossing some mountain passes and hit all the way down to the Ba Be lake. 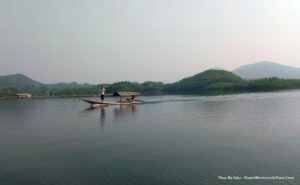 This motorbike ride to Ba Be lake takes about 4 hours so we’ll have lunch when reaching to the lake, after lunch we’ll have short boat trip around the largest Natural lake in Vietnam – Ba Be lake. This is the highlight of the day and also of this Vietnam motorbike tour, this promise to be best relaxing time after a long motorbike ride on ad off-road in mountain areas in Northern Vietnam. 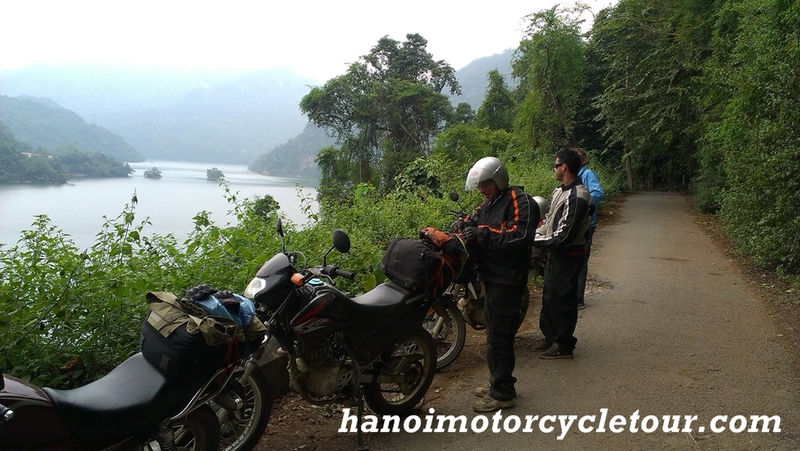 Ending the 8 day enjoyable motorcycle tour in North Vietnam with a long ride back to Hanoi from Ba Be lake. 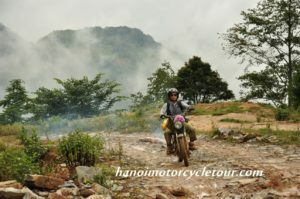 The ride in the morning is still on the mountain passes or rugged roads, the experienced team of Vietnam Motorbike Tour Expert will do their best to ride on the safe and easy roads as more as possible to get closed to Hanoi. When we get closer and closer to Hanoi there’ll be no choice but to join the busy road with the local to ride back to the city center. The tour will end at around 4:30 PM. This is one of our unique motorbike tours in North Vietnam, Within 4 days, the experienced team of Hanoi motorcycle tour will take you faraway from the hustle and bustle of Hanoi city by riding motorbike on the back-roads through countryside to the mountain area where you can find difficulties to see other tourists but easily to meet the smiling faces of the colorful hill tribes or amazing view of mountain, and nature. The tour does not offer famous attractions but it really a great short motorbike ride to experience the hidden beauty of Vietnam! 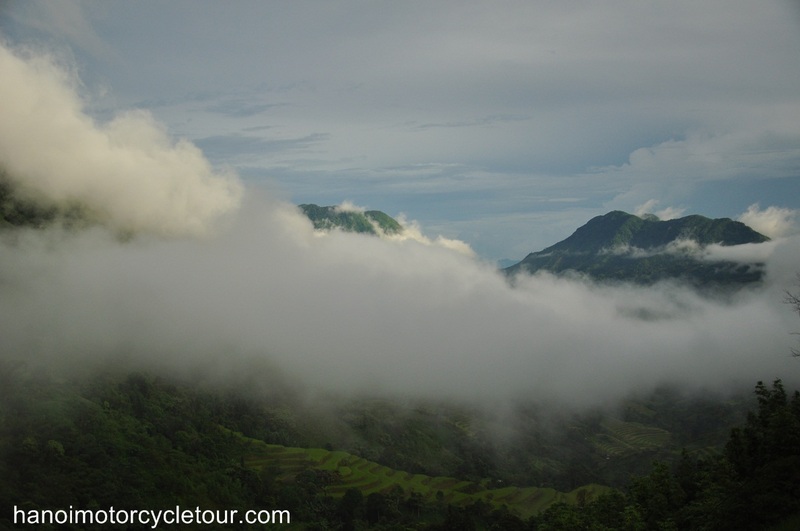 Mai Chau valley’s probably the most famous attraction in this short motorbike tour. Like many Vietnam motorcycle tour organizers doing tours to this beautiful valley, but we promise to provide a unique route to the valley which offers more beautiful view of countryside and more enjoyable ride on back roads instead of riding on the regular highway No 6 to the valley. It must be the highlight of this 4 day motorbike tour in Vietnam. After walking around the beautiful village of the Thai people in the valley, we’ll get back to the bikes and keep motorbike touring in northern Vietnam. Distance of 150 km sounds short to ride for a day but it’s not. This Mai Chau motorbike tour to Phu Yen can’t be end early because the ride is mostly on winding passes in which you can stop for the picture on every meters of the road. 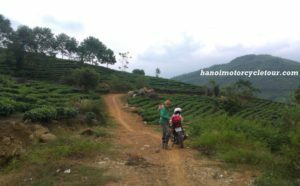 We will cross the Moc Chau plateau where you can have a short off-road motorbike ride through the green tea fields or large garden of plum and peach trees. After lunch in Moc Chau, we’ll continue the beautiful North Vietnam motorbike tour on the mountain passes and along the picturesque Da river lake. We’ll be in Phu Yen at about 4:30 pm. It’s another short motorbike ride in North Vietnam but it should be another highlight of this 4 day Vietnam motorcycle tour. In the morning we keep riding up to North Vietnam on the winding road through some more beautiful tea fields. Lunch will be in Yen Bai IMAG0805town, after lunch we’ll hit the road down to Thac Ba lake arrive the lake at about 3:00 pm. Leave the bikes in the village of the friendly Dzao people which located on the lake bank then enjoy short boat trip on Thac Ba lake. Start the last day of the North Vietnam motorbike tour back to Hanoi at 8:00 am after a simple breakfast with the friendly Dzao people. 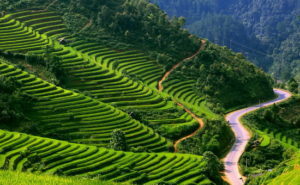 Depending on your requests, we can do a little bit off-road around the village before heading down to Hanoi or just slowly ride back on the back – roads through some green tea fields, rustic villages and along the river bank. We will be back to Hanoi at about 4:00 pm and end the enjoyable motorbike tour in North Vietnam easily before rush hours.